How to detect IMU is rotating around itself or rotating around some point in space? 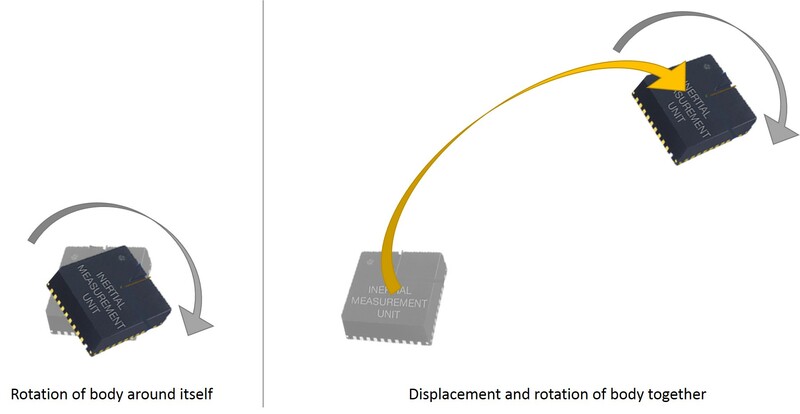 I want to figure out how to detect whether an IMU is rotating around itself or it is rotating around some point in space? Look at image below for illustration. I can get orientation(Euler) angles from the IMU correctly and find out how many degrees it is rotating. But cannot detect it is in the same position or not? I have accelerometer, gyro, magnetometer data and also quaternions. But couldn't use them mathematically to calculate the displacement of the sensor correctly. I know it is almost impossible to get displacement from accelerometer by double integrating it. But this displacement calculation will be done for maximum of 2-3 seconds and then will be refreshed. In sum, I want to figure out which one of the movement in image above is being done with the IMU. Is there anyone who knows better displacement calculation for just 2-3 seconds period or maybe there is a quite different way to distinguish these two types of motion of IMU. I appreciate for any kind of help in advance. Browse other questions tagged accelerometer gyroscope motion-detection euler-angles imu or ask your own question. Applying Quaternion based correction on accelerometer data/displacement data?